Our Spiti trip was planned to take place shortly (five days later, to be precise) after the Uttarkashi natural disaster in June 2013. Spiti lies in Himachal Pradesh, which too was hit, but majorly up till Kinnaur region (a region that borders Uttarkashi). Life was still in process of restoring itself when we reached Manali on 22nd June 2013. Even the roads to Lahaul & Spiti (through Rohtang Pass) had opened just two days ahead of our departure to Kaza. Since the news from our sources was not very encouraging, we were apprehensive about the weather and road conditions. We needn’t have worried about the latter, as there ARE no roads to Spiti (OK , there are roads, but not continuously from Manali to Kaza). We checked for news updates related to the Spiti valley till the night before our journey and were on tenterhooks till the onset of the journey. Apparently, the authorities had cleared the snow and landslides, to make the roads reusable. During the entire span of our stay at the Spiti valley, there was no electricity but the valley is very well equipped with solar power. There are Solar lanterns, geysers, power-backup (at some places) and you don’t really feel much of discomfort. Just to put things into perspective, Spiti is a part of northern India, and lies in a state called Himachal Pradesh. i have marked it on the map to explain this better. Shortly after we hit Rohtang Pass, our cell-phone had limited signal reception and soon after Gramphoo there was simply none at all. In my opinion, holidays without the cell-phone are the best of the kinds. As you do away with your phone, you live the entire experience with a little more than your five senses. On the way, we took regular breaks to acclimatize ourselves during the entire course of our journey. Our stopovers were at Gramphoo, Chhatru, Battal, Kunzum Pass, and Losar. Gramphoo has metalled road till the point from where the road divides for Spiti and Leh. One road takes you to Leh and the other one turns towards Spiti. The condition of the road deteriorates a bit once you turn for Spiti. After a few kilometers, it turns into a stone-paved road, with mountains all around you as you drive past them. It is a rocky terrain and the way tends to get submerged into streams of water (melted snow) from the Himalayas. After Gramphoo, our next stop was Chhatru. Chhatru has this raging Spiti river flowing next to the road and it offers amazing scenic view all around. The landscape is rocky and has moss-like-greenery all around. Shortly after we had resumed our journey from Chhatru, we came across a group of bikers going towards Gramphoo on their Royal Enfields. We, incidentally, were passing a stretch of land that was submerged into the stream. Since it is a stone paved path, it is not possible to drive at more than 20 km an hour. After observing the bikers for a while, I felt that it would make sense for bikers to start early as, as the sun goes up, the streams gain momentum and depth. The depth of the stream can add to the problems if one has to stop for some reason. The weather, all through our journey was extremely hot. Once the pictures were clicked, we set on the journey again and our next stop was Battal (for tea and photography). From Battal, a different route takes you to Chandratal, which is at a distance of 14 km from there. 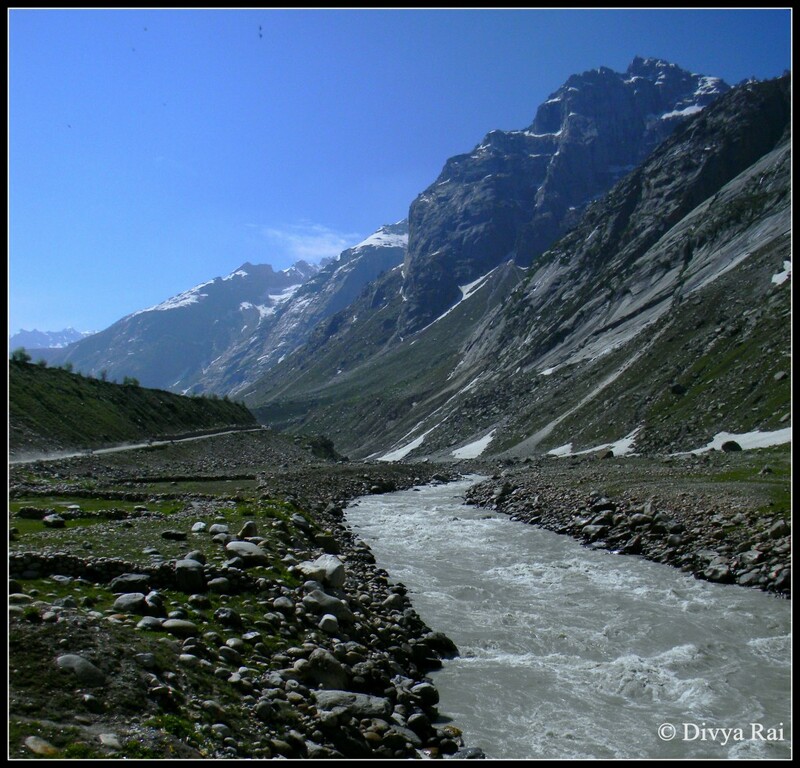 Our initial plan was to undertake the trek to Chandratal (28 kms) on our way back from Spiti. This was there in our wish-list till we trekked up to the Dhankar lake (Day 2) (5 km). Post-Dhankar, better sense prevailed and we dropped the idea. The important fact about Battal is that it serves as a crucial stopover for tourists and hence it is provided with a temporary night-shelter for people who have to take a break from their journey unexpectedly. Himachal Pradesh government has made these night-shelters called the white houses, at several places though-out the area. Next on the way was Kunzum pass. A stop-over here is must as it gives you an amazing view of the snow-capped Himalayas. Do not let the view of the snow-clad Himalayas fool you. It is fairly hot at Kunzum Pass. Once there, you do the customary circling the temple instead of driving straight past it. It is believed to bless your journey ahead. As you touch Losar, the landscape changes from picturesque to awe-inspiring. We took our lunch break at Losar and felt very slight thinning in the air, here onward. The sky is much clearer in Losar than at all the places mentioned earlier. After approximately two hours of drive from Losar, we reached Kaza. One remarkable fact about the road-journey was that post-Gramphoo (when we still had 150 kms ahead of us to reach Kaza), we barely over-took any vehicle, nor did any other vehicle overtake us (almost). For 50-60 kilometers at a stretch, yours could be the only vehicle driving to or from Spiti. And it can be a very bad news in case your vehicle breaks down, and your phone doesn’t work. We reached Kaza after 12.5 hours of drive from Manali. Kaza is located at a height of approximately 12,500 ft above sea-level and is the commercial capital of Spiti valley. On the way, or once you reach, you might experience various phases of H.A.S. (high-altitude sickness). We were advised by our Spiti travel organizers to take a medicine called Diamox. It helps to counter the HAS and its effect. It is recommended that it strictly be taken under the medical supervision only. When I talk about medical supervision, you would soon know why I say so. Most of us were experiencing a general breathlessness because of the thin air. I had breathlessness coupled with pounding headache. Upon arrival, we had our evening tea and freshened up. A bunch of us decided to go for a photo-walk close to the river. The evening natural light was extremely beautiful. It was quite bright and clear for 6:00pm. My room-mate and I decided to stay in our room and take a nap. We reasoned that it would help us acclimatize to the change in environs. I was surprised that I was feeling uncomfortable despite taking the required medication for the trip. What baffled me was the fact that my roommate had not taken any medicine, despite the advice from our travel co-ordinators. She felt a bit worse with this strange nauseous feeling all the while. We decided to take a nap until dinner time, which was 8:00pm. Both of us got up a bit before the dinner. My breathlessness had gone but the headache persisted. We had our dinner and filled our water bottles for the night (you do not buy water-bottles in Spiti, you buy water. This is to ensure that the plastic bottles are recycled more and disposed off less). After dinner, as the last resort, I took a painkiller and slept early. The next day was to begin at 7:00 am. My roommate too decided to take Diamox to counter HAS and hit the sack to get some decent amount of sleep. Somewhere in the middle of the night, at around 2:00am or so, I woke up to an extremely unwell roommate who had severe bouts of vomiting. I think she had thrown up the medicine as her system just did not accept it. Turns out, she was allergic to the compound called “sulpha” and that was what had reacted. I mentally thanked the universe for this minor repercussion as Kaza has a limited medical facility and a medical emergency at 2:00am would have been slightly difficult to handle. Things to pack for a day like this? 1) A travel-pillow like this might come handy. 2) A water-bottle, or the one with an infuser if you have travel/mountain-sickness. 3) An excellent quality sunscreen. I use this one; works amazingly well without making the skin oily. If you are travelling on your own, you can use this deals-finder to look for a property and book a place for yourself. I use this site frequently, as they do not charge anything for cancellation. Since I wanna travel to leh, kherganga, spiti, Kasol.. I guess i hv made my choice to start from spiti. 1) while planning the route you obviously haven’t looked at the map, because you say you want to start from Spiti. In your route would, more like be Kasol, Shimla, Spiti, Gramphoo, Leh. 2) I do not advise trip planners that I haven’t tried myself; can’t vouch for random folks. Whatever is there as recommendation, is up on the blog. 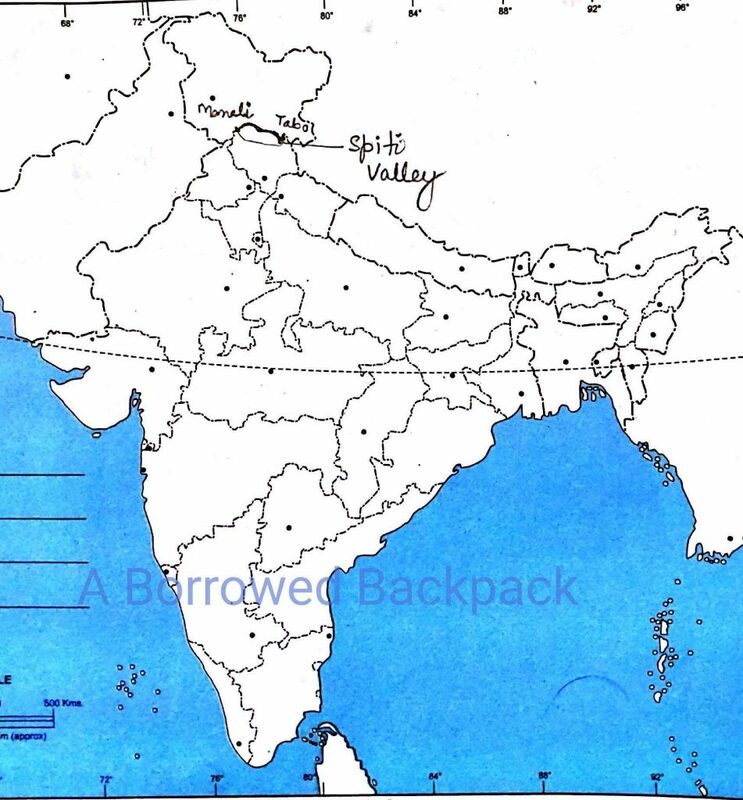 I wanna go for the same trek… Any trip planners that u recommend?? You can go with Spiti Ecosphere; I went with them too. I have heard the same too. You can give it a shot. However, I would still choose Manali route over Shimla route ( unless old people and kids are travelling too) because that is where the fun lies; at least for me. Did you go on bike or by other means – car or tempo ?